Source: Environmental Working Group. 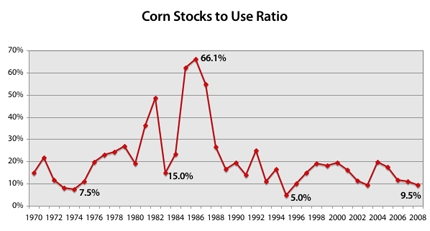 Data compiled from the U.S. Department of Agriculture Economic Research Service. c) increases the blenders credit to keep the ethanol plants running. The method currently in place in the RFS would put the burden on ethanol blenders, but taxpayers could be forced to pick up the tab through increased or new tax credits or other efforts to keep ethanol plants open. U.S policy to promote the production of food crop-based biofuels is both short-sighted and dangerous. High corn prices will limit the contribution corn-based ethanol can make to our energy supplies, unless taxpayers are asked for more and more subsidies and credits to support the industry. The more corn diverted into fuel production in hopes of solving our energy problems, the greater the risk imposed on hungry people. The whole world, from average Americans to the poorest billion people on the planet, cannot rely on America’s food-to-fuel gamble. We need to step back from our current policies and chart a new course to a more sustainable biofuels policy.